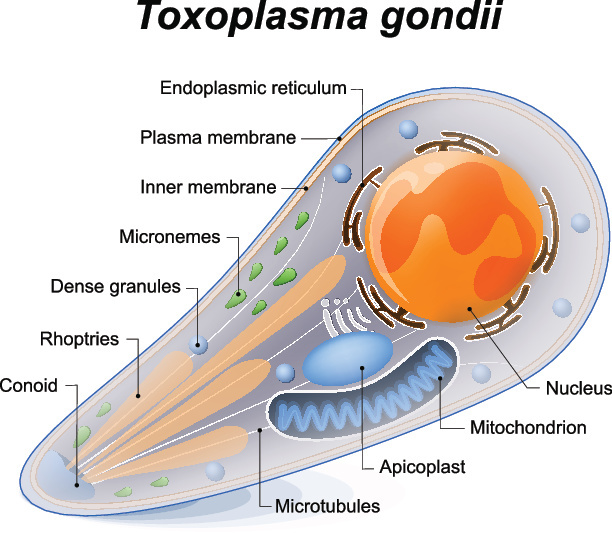 Toxoplasmosis is a disease caused by infection with the parasite toxoplasma gondii. Because the immune system of a healthy person is generally strong enough to prevent the parasite from causing any major health concerns, you probably don’t hear much about toxoplasmosis outside of the context of pregnancy. Because the parasite is able to cross the placental wall and cause harm to a fetus, toxoplasmosis infection during pregnancy is of Sconcern. Cats are often considered the most likely culprit to spread toxoplasmosis to humans or other mammals, as they are the only mammal in which the parasite can fully complete its life cycle. Cats are infected with toxoplasmosis from either coming into contact with the feces of other infected cats or by consuming birds, rodents, or other animals with the disease. When a cat becomes infected, it will shed immature parasite eggs in its feces for a couple of weeks. When a human or other mammal ingests these immature eggs, an infection occurs. Cats aren’t the only disease perpetrator, however, as toxoplasmosis can be transmitted through ingestion of certain foods or contaminated water. Some animals (such as pigs, lamb, and deer) might carry the disease and consumption of undercooked meat from an animal with the disease will lead to transmission. Fruits and vegetables grown in the soil can also be contaminated with parasitic eggs. Should you get rid of your cat? Should you avoid petting a cat? How can you prevent toxoplasmosis? No, there is no need to give away your furry feline if you are hoping to expand your human family! And petting a cat infected with toxoplasmosis will not transmit the disease. Because the disease is spread through parasitic eggs found in cat feces, the litter box is the riskiest place for infection. If possible, have your partner or another member of your household clean the litter box during your pregnancy, particularly if your cat goes indoors and outdoors. If that’s not possible, using sanitary precautions such as wearing gloves and a facemask, and thoroughly washing your hands after coming into contact with the litter box, will prevent infection. If you have a sandbox in your backyard, it’s also a good idea to keep it covered so any outdoor neighborhood cats don’t make themselves at home. Pregnancy is probably not the best time to take in a litter of stray cats or kittens that might carry active infections, but following basic hygienic practices should ensure a safe pregnancy alongside your family’s current cat(s). To prevent the spread of toxoplasmosis through diet, consume well-cooked meat that reaches an internal temperature of 160º F. Freezing meat for several days prior to consumption will also kill the parasite. Thoroughly wash all fruits and vegetables, and wear gloves and wash your hands as often as possible if you spend time gardening outdoors. Modern water filtration systems are extremely effective at removing any parasite eggs from drinking water, so there is little concern for water transmission in developed countries like the US. If you are traveling in less developed countries during pregnancy, only drink water from reliable filtered sources. What if exposure has already happened? The Centers for Disease Control and Prevention (CDC) estimates that 11% of people in the US are infected with toxoplasmosis, but don’t let this statistic worry you if you are thinking about getting pregnant! The parasite can only cause harm to a baby in utero if the pregnant mother has an active infection. If a mother already recovered from a toxoplasmosis infection, then she cannot pass the disease to her baby. A simple blood test can be done at your doctor’s office to determine if you have already been exposed to the disease. If you elect to have the test done prior to or during pregnancy and find out that you have immunity, then consider yourself lucky… Unless you were hoping to get out of litter box cleaning duties! Kravetz J, Congenital toxoplasmosis. BMJ Clin Evid. 2013. Dr. Kristen Hollinger has a Ph.D. in molecular and cellular biology from Pennsylvania State University. She currently resides in Maryland and works as an Instructor in the Departments of Psychiatry and Neurology at Johns Hopkins University School of Medicine. Her research focuses on neurological diseases including depression and multiple sclerosis.